Days after Miley Cyrus' wedding, Twitter remembers this breakup tweet. The very awkward tweet Miley Cyrus wrote in 2013 about her now husband, Liam Hemsworth. 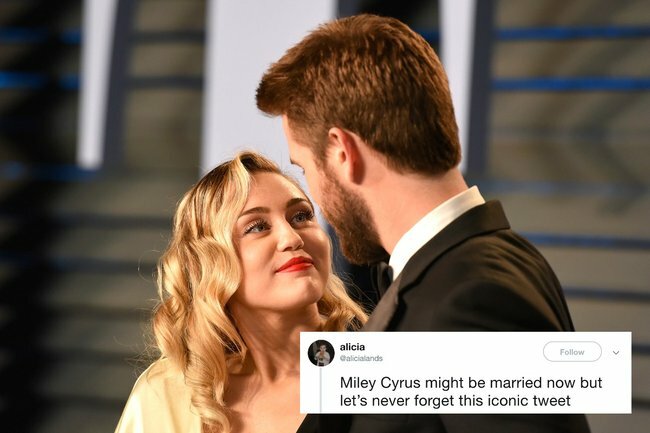 Days after Liam Hemsworth and Miley Cyrus celebrated their wedding, the internet has resurfaced a particularly pointed tweet from the singer’s Twitter account circa 2013. Although Cyrus, 26, and Hemsworth, 28, first got engaged in 2012, after meeting in 2009 while filming The Last Song, the couple would later break up in September, 2013. Cyrus went on to release her fourth studio album Bangerz and write her 2014 hit Wrecking Ball, while Hemsworth went to star in the second instalment of The Hunger Games franchise, The Hunger Games: Catching Fire, which was released in November, 2013. Except, as can be expected, the singer had absolutely no intention of watching the film, and she made that very clear on her Twitter account. But, little did she know that in just over five years time, she would end up marrying the very subject of her tweet, and thanks to her fans, and the wonders of a screenshot, we have eternal proof. Of course, the couple would later reunite in 2016, before saying their ‘I dos’ two years later. Did Miley’s 2013 tweet make you laugh? Tell us in a comment below. Miley Cyrus talks about her engagement and why it’s not exactly her style.